Rawai Muay Thai is well-known in the Phuket area for training Thai and foreign fighters of all ages and levels. On November 28, they used their popularity to raise money for some much needed improvements at a local school. With two belt title fights, the 500th fight of one of their trainers, and 13 other pairings the local community and tourists came out in droves to support the cause. Rawai Muay Thai is well-known in the Phuket area for training Thai and foreign fighters of all ages and levels. On November 28, they used their popularity to raise money for some much needed improvements at a local school. With two belt title fights, the 500th fight of one of their trainers,and 13 other pairings the local community and tourists came out in droves to support the cause. As water flooded the walkways of Khuk Khak Primary school in Khao Lak this rainy season, the students found it hard to move from class-to-class without getting their work and themselves completely soaked. Tuk and Diana, owners of Rawai Muay Thai,realised they could help. With the idea of building covered walkways connecting the buildings the Muay Thai Spectacular was born. Tickets ranged in price from B250-B1,000 and some community members simply purchased tickets to support the training camp’s fundraising efforts. The students of Rawai showed their team spirit as the multicoloured school shirts were dispersed throughout the crowd, and the loud multi-lingual cheers roared as the fighters took to the ring. Of the sixteen matches Rawai fighters took part in seven. American Rawai student Dean fought Gulabpet from Thailand and won by TKO in round four. Petpakchong fought a strong five rounds winning by decision. A crowd favourite, 12 year-old Mongkunpet, one of the Rawai trainer’s daughters, won by TKO in round two earning a trophy for fastest KO of the night. The nine-year old sensation Sittichai was paired with Superbike for the 25kg South Thailand Title Fight. The bout ended in a draw with Rawai’s Sittichai digging deep to give Superbike a major challenge. Superbike was the odds favorite as he already had 77 fights to his name versus Sittichai’s 25. 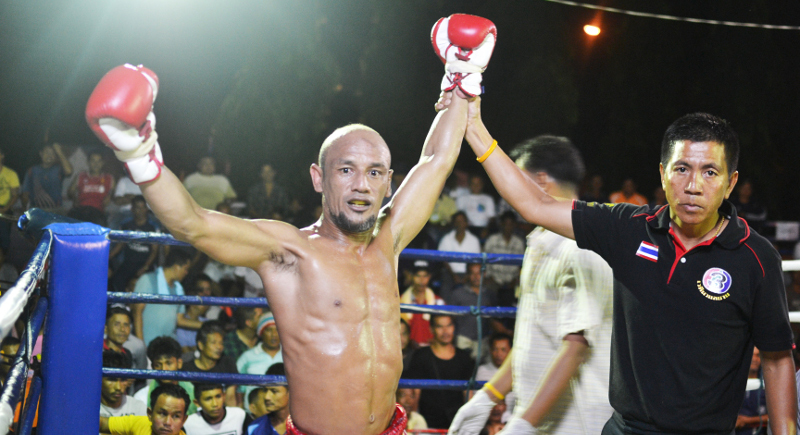 A beloved Rawai trainer, Lemsing fought Neung Siam in his 500th and final professional fight. The Rawai students went wild as Lemsing knocked out his opponent in round three ending with his signature Lemsing shuffle. In addition to ending his career on a high note, he also won the evening’s trophy for nicest Wai Kru. Nationally ranked Madsing, also known around the gym as Top, won by KO in round 3 and earned the trophy for best sportsmanship. While Rawai did make a strong showing, Weikrating who fought Wutichailek lost by KO in round three.Tepwarit, who was fighting for the 118lbs South Thailand Title lost to Leklai by decision. While the fights were certainly entertaining, the purpose of the evening was never forgotten, as between rounds the announcer tallied the money raised. In the end the event raised over B400,000. Construction on the walkways for the students of Khuk Khak are scheduled to begin later this month. When asked why they went through the effort of arranging such a spectacular event far from the glitz of Phuket and Patagon, Diana and Tuk said, “Rawai is part of the Khao Lak community. We saw a way we could help so we did.” A simple answer that will make a positive change for hundreds of students. Thai gyms in the country. In addition to training students from around the world, Rawai trains aspiring young Thai boxers. Rawai fighters have boxed in Bangkok’s prestigious Lumpini and Rajadamnern stadiums and in major promotions such as Thai Fight, on national television, and abroad winning numerous stadium titles as well as the World Muay Thai Council (WMC) and the World Professional Muay Thai Federation (WPMF) titles.